David has been quite the busy king. The Philistines have kept him busy. David spent many years of his reign fighting those invaders from the west and finally after much blood and struggle, the land of Israel had "rest from all his [David's] enemies around him." So what is a king in leisure to do? David decides it is time to give God a house-- a permanent house-- a temple in which to dwell. The last house Yahweh had was the temporary tabernacle that made its way with Israel through the wilderness on their way to the Promised Land. David consults Nathan the prophet and Nathan is favorable to the idea. But how true it is that God can have plans other than kings and prophets. But that same night the word of the Lord came to Nathan: Go and tell my servant David: Thus says the Lord: Are you the one to build me a house to live in? I have not lived in a house since the day I brought up the people of Israel from Egypt to this day, but I have been moving about in a tent and a tabernacle. Wherever I have moved about among all the people of Israel, did I ever speak a word with any of the tribal leaders of Israel, whom I commanded to shepherd my people Israel, saying, ‘Why have you not built me a house of cedar?’ (2 Samuel 7:4-7). 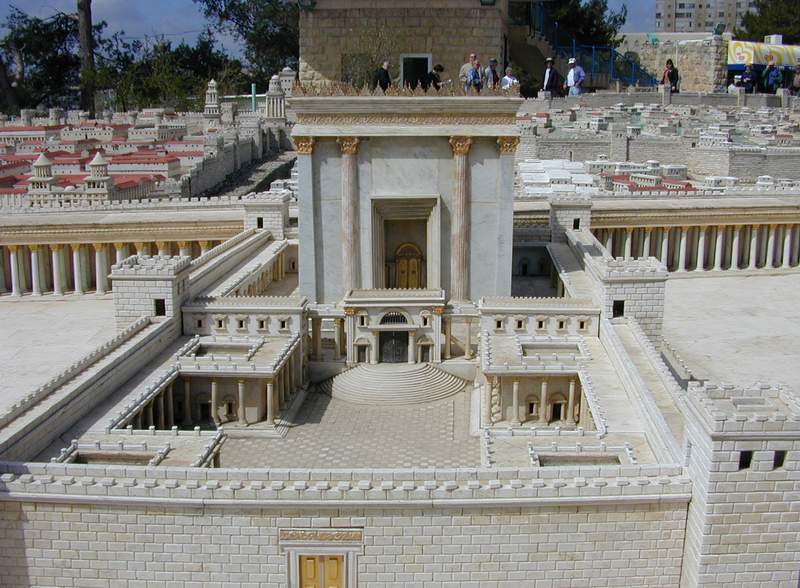 If there is a particular reason why David is not permitted to build the temple, 2 Samuel 7 does not say. Later commentary on this story suggests that David had too many other issues to deal with during his reign (1 Kings 5:3-5) and the Chronicler indicates that David's bloodshedding ways disqualified him (1 Chronicles 22:8 and 28:3). But one thing is certain. David is not the one to build a permanent house for God and one cannot help but believe the king was very disappointed. But in the midst of God's rejection of David's plan, God give the king an even greater promise-- a plan that that is far greater for the house of David than a structure of stone and mortar. "Your house and your kingdom shall be made sure for ever before me; your throne shall be established for ever" (2 Samuel 7:16). God will fulfill God's purpose through through David's throne without a temple. To be sure, David's son Solomon will build a temple for the God of Israel, but here God has something less constraining in mind. It must be said, that as important as the temple was for ancient Jews, its existence was always something of a tension in their theology. How can the one true God of the universe who is everywhere be contained in a temple made with hands? During the Christmas season we sing the following from the hymn "In the Bleak Midwinter,"
‘Woman, believe me, the hour is coming when you will worship the Father neither on this mountain nor in Jerusalem. You worship what you do not know; we worship what we know, for salvation is from the Jews. But the hour is coming, and is now here, when the true worshippers will worship the Father in spirit and truth, for the Father seeks such as these to worship him. God is spirit, and those who worship him must worship in spirit and truth' (John 4:21-24). Yes, David was likely disappointed that he could not do for God what he believed God wanted; but what God had in mind was bigger than David's plans and much better for David's legacy. David's throne would be established forever. His house would be eternal and universal. Jesus Christ would bring such tidings of great joy to all the people. Good point. We often want to do something for God. God doesn't always want that done, or want that done by us. Yes. And God's vision is always larger than ours.